It could signal the end for SGVHS if San Gabriel ultimately decides to contract with either PHS or the Los Angeles County Department of Animal Control. The city will negotiate a 60-day interim contract under acceptable terms with SGVHS, giving the nonprofit organization an opportunity to address issues with its annual fees, discrepancies involving its financial reviews, and the quality of its animal control services. Although poised at Tuesday’s meeting to consider the Pasadena Humane Society as their animal control provider, council members decided to enter into an interim agreement with SGVHS as a gesture of good faith toward the city’s business friendly plan. An emotional turnout with 50 or more SGVHS employees and volunteers helped illustrate the pending fate of this nonprofit. Councilmember John Harrington said he believed that if San Gabriel terminates its animal control services with SGVHS there would be layoffs in the city. But Councilmember Juli Costanzo, who cast the only dissenting vote to continue negotiations with SGVHS, raised concerns about the humane society’s management practices and alleged failure to provide financial documents to the San Gabriel Valley Animal Joint Powers Authority. The now defunct JPA provided its four member cities (including Monterey Park, Temple City and Azusa) with affordable animal control services by contracting with the SGVHS. Having represented San Gabriel as one of the member cities on the JPA board, Costanzo said she must act in the best interest of taxpayers when considering quality animal control services and the provider’s financial obligations. 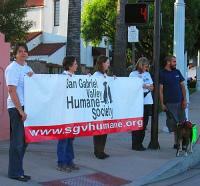 San Gabriel stood to lose its animal control services beginning Jul. 1 because the SGVHS and JPA were unable to reach a contract agreement in May. As a result, the JPA executive committee elected to dissolve the JPA, terminating its contract with the SGVHS effective Jun. 30. Without contracting through the JPA, San Gabriel would lose its animal control sheltering, licensing and after-hours service provided by SGVHS. Before Tuesday night’s discussion, city staff recommended that council approve a two-year agreement with the Pasadena Humane Society in the amount of $158,872 per year for Fiscal Years 2012-13 and 2013-14. In comparison, the San Gabriel Valley Humane Society had notified the City of San Gabriel on Dec. 5 that its annual rate would increase from $118,000 to $266,000, according to Costanzo. Monterey Park, who voted to terminate its agreement with the San Gabriel Valley Animal Joint Powers Authority at its May 16 meeting, decided to negotiate an agreement for animal control services with the Los Angeles County Animal Care and Control Department that would not exceed $10,000 annually. Azusa has done the same, and Temple City is still deciding the issue. For information on the San Gabriel Valley Humane Society and its services, contact the SGVHS at (626) 286-1159 or visit their web site at www.sgvhumane.org.